StructureScan Optical™ has revolutionized 3D data collection by simplifying an often complicated survey process while providing the most versatile GPR solutions in the industry. StructureScan Optical is the only concrete inspection tool on the market with optical barcodes and patented Smart Pad technology for simple error-free scanning. What Makes StructureScan Optical the Best? 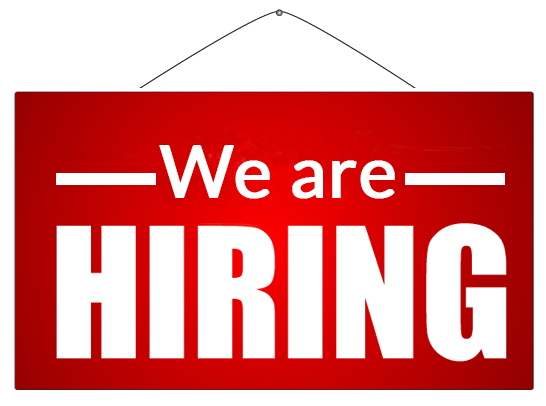 – Get the best results based on your jobsite needs. The StructureScan Optical is offered in two versions, a 1600 MHz and 2600 MHz antenna—making it the most versatile system in the industry. 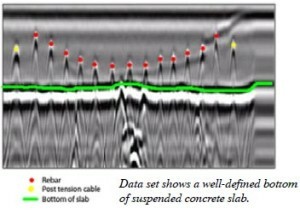 Concrete and construction professionals use StructureScan Optical to safely locate structures within poured concrete prior to drilling, cutting or coring. Take advantage of locating targets in real time, with only single-sided access required. with a target (labeled in blue) attached to a piece of rebar. 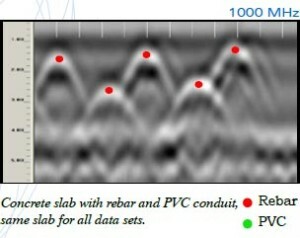 3D data from field (left) – result showing rebar mat. Determine post tension (P.T.) 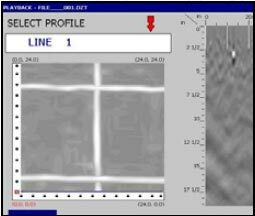 cable draping characteristics through accurate 2D depth imaging with the StructureScan Optical. Avoid costly repairs and potentially dangerous events by locating post tension cables prior to cutting or coring work. 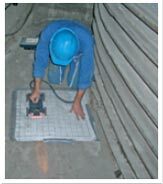 Contractors and engineers alike use StructureScan Optical to determine the thickness of suspended or on-grade concrete slabs. With a depth range up to 18 inches (0.5 m), the 1600 MHz system offers a great balance between data resolution and depth penetration in concrete. With a depth range up to 12 inches (0.4 m), the 2600 MHz system offers the highest frequency GPR antenna in the industry. 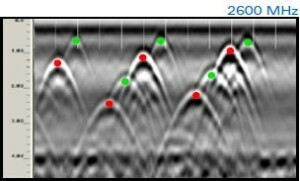 The higher resolution provides clear, easy-to-interpret data images and makes complicated job sites less obscure. 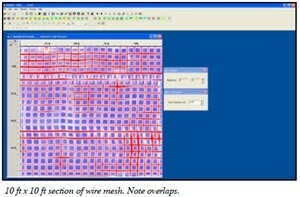 RADAN™ is GSSI’s post-processing software. With its modular design, this program allows users to select the processing functions that best suit their needs. RADAN is Windows™ based, providing a familiar and easy-to-use environment for all levels of experience. 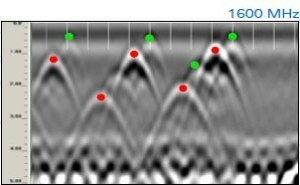 • Built for all levels of experience- RADAN’s Structure ID Module is a Windows™ based software program that provides a familiar and easy-to-use setting for post-processing GPR data. • Enhanced and simplified 3D viewing. locations and depths on simple concrete structures. • Interactive mapping of conduits or other subsurface features within concrete structures. 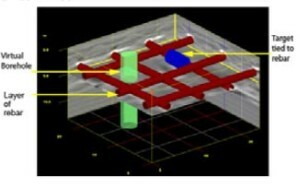 • Semi-automatic mapping of deterioration zones within concrete structures. • Permits simple integration with spreadsheets or other programs. • Help feature includes key information, several “how to” guides, index and search feature.